Prince Avalanche, David Gordon Green’s latest film, is being touted as a return to form for the director who has experienced spotty success in recent years. It’s an interesting observation for me to come across, given my limited knowledge of his previous work which includes Compliance (producer) and arguably his worst films Your Highness and Pineapple Express (director). The train of progression from these films to Prince Avalanche is very clear, with the latter being a return to his indie roots that still manages to maintain the odd sense of comedic timing present in the former films. Prince Avalanche is a little off, it doesn’t quite hit all the places I’d like it to, but without a doubt there is a place for Green and that place is nestled in the cozy wooded lands embodied in independent film. Prince Avalanche takes place in such a specific time and place it warrants a title card at the beginning of the film. It’s the summer of 1988, and two road workers Alvin (Paul Rudd) and Lance (Emile Hirsch) are charged with repairing rural Texas highway ravaged by wildfire. The only link between Alvin and Lance is Alvin’s relationship with Lance’s sister, otherwise the two don’t seem entirely interested in getting to know each other. There’s a difference in age, a difference in maturity, and the film’s only purpose is to bare witness as these two characters discover a way to relate to each other in their isolated surroundings. Like Green’s previous work, this style of film isn’t for everyone. The pacing is slow, taking its time to linger on moments that would probably pass without a second glance in another film. It’s a risk because the dialogue isn’t particularly interesting, but in that way it closely resembles reality. Understanding the pacing is important because the comedy in this film, while present, requires some deciphering and the complete attention of viewers. It’s dry, matter of fact, and those used to Rudd’s usual repertoire may miss the subtlety. Alvin is a different role for Rudd, and I rather like him in it. I didn’t warm to him immediately, and because the film lacks a plot and greater character development, the real growth comes from the audience understanding these characters as they exist in the here and now as much as they come to know each other. It’s refreshing to see Alvin and Lance come to their own conclusions without grand gestures or pedantic one-line philosophical epiphanies. Those familiar with Green’s work will see Prince Avalanche representing the best of Green’s peculiar directing style, without the big studio wrapper. This style doesn’t resonate with me, but the trajectory of Green’s work thus far has been one of the more interesting aspects to explore. The vein is present in all of his films, but he’s at home in the world of indie film, and it’s in that frame of reference where Prince Avalanche shines. 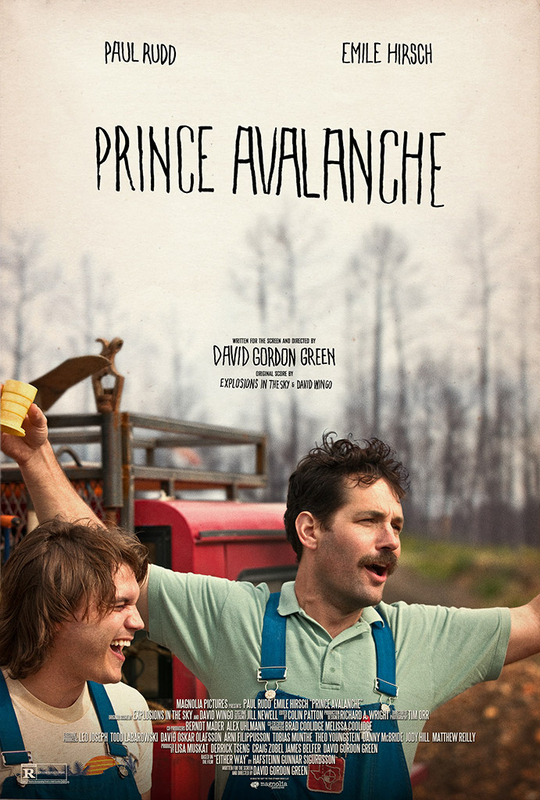 Prince Avalanche opens today at the Ritz Bourse.